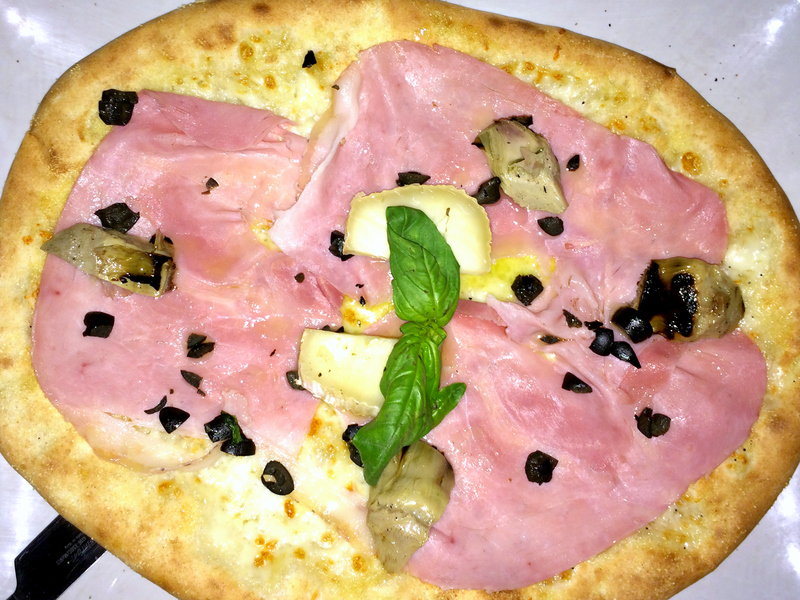 Charcoal-roasted ham, violet artichokes in olive oil, casatica di bufala, oven-baked olives, mozzarella di bufala, and fresh basil. I love that pizza is not considered a full meal in Italy. Once during our trip I ordered a pizza and small salad for lunch and nothing else. I overheard my waiter tell another waiter that I was “just having pizza for lunch” (not in a rude way, but rather so that he would know how to space out the meal). Just pizza? In my world, eating pizza for lunch implies that I am having a pretty big lunch! The crust at Obika is incredible. Staying true to the tradition of Italian “slow food”, Obika uses slow-rise dough from a selection of quality stone-ground wheats that are kneaded together and left to rise for a minimum of two days before being baked on a refractory stone. The result is a heavenly crust that is both crispy and chewy, as well as deliciously flavorful and surprisingly light. The crust is covered with a thin layer of melted mozzarella di bufala and topped with an abundance of delicious prociutto, marinated artichokes, little bits of flavorful kalamatas and aromatic basil with just enough of the pungent casatica cheese to have a tiny bit with every bite. it is an amazing combination that I won’t soon forget! I think I would eat pizza every day if I lived in Italy. That is so beautiful! And it seems to transcend “pizza” as we know it her in America. Domino’s it is not! What a wonderful experience you had in Italy–the culture, food, etc. What a great idea! This pizza would make a great breakfast! Did I tell you I really enjoy reading your posts? you write very well and in my world pizza is dinner (entree, main course and dessert in one). I’ve never been to Italy and you make me want to go there! What a nice comment – thanks. 🙂 I bet you would love Italy. The food in Rome was incredible, and from what I hear it only gets better in the countryside. I hope to go back someday. Countryside it shall be for me then…I would love to experience the food!! !